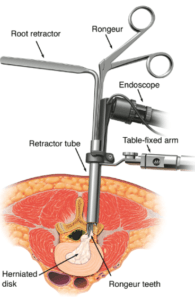 MicroEndoscopic Discectomy (MED) - Matthew D. Hepler, M.D. Discectomy is a surgical procedure which removes a herniated disc that compresses a nerve root causing neurologic injury with back and leg pain using a minimally invasive tubular retractor. Its usually performed on patients with persistent leg pain, numbness, tingling or weakness that has failed to improve with non operative treatment. Discectomy was first reported by Mixter and Barr in 1934 through an “open” approach. Since that time the procedure has been refined and now performed with minimally invasive spine, (MIS) techniques utilizing 20 mm incisions (microedoscopic discectomy, MED). The procedure involves removing the herniated fragment of disc and any other compressive lesions through a tubular retractor. Its performed as an outpatient procedure. Most patients usually have immediate improvement in pain, return to work in 5-10 days, and resume pre-injury activity levels within 8-12 weeks. Who is a candidate for MED? What is involved in MED? Microendoscopic discectomy is an outpatient procedure that is performed under general anesthesia. It usually takes 45-60 minutes and involves a small incision (20 mm) through an endoscopic approach with a tubular retractor. A small portion of bone and ligament is removed to allow exposure of the herniated disc and affected nerve root. Using magnification loupes or a microscope the disc fragment and any other compressive lesion (bony spurs, thickened ligaments) are removed and the nerve inspected and any adhesions released. Patients are discharged home the same day and usually return to work in 5-10 days and normal unrestricted activities in 8-12 weeks. What are the pros and cons of MED? Microendoscopic discectomy is a very successful procedure when performed on properly selected patients. As many as 90-95% of patients are better and many return to pre-injury level of activity. The risks of surgery include but are not limited to infection, dural tear (resulting in leaking of clear spinal fluid), neurologic injury, recurrent disc herniation, and chronic back or leg pain, numbness, tingling, or weakness. In addition there are potential medical risks for anyone undergoing general anesthesia which may necessitate a preoperative medical evaluation.